They released a study this morning in Austin called “Build a Better Texas”. Wage theft results in lost tax revenue: at least $117 million in lost wages and $8.8 million in lost sales tax revenue impact cash-strapped state and local governments. Texas construction workers are forced to fall back on public safety nets to support their families. Low wages and wage theft contribute to economic instability for construction workers and their families. Fifty-two percent of Texas construction workers report that they were unable to meet the basic needs of their family at some point. Injured construction workers account for a disproportionate share of uncompensated care costs in Texas hospitals. While construction workers make up roughly 6% of the workforce, hospital data suggest that they account for nearly 20% of work-related uncompensated care costs in Texas emergency rooms. Rampant payroll fraud results in an estimated $54.5 million in lost unemployment insurance tax revenue and hundreds of millions more in federal income tax. With over 40% of the construction workforce misclassified as independent contractors or paid under the table, Texas and the federal government are losing out on critical revenue. The Legislature could attack these problems on multiple fronts, and the effort is clearly bipartisan. State Representative Joe Deshotel, D-Beaumont, has filed a bill that would crack down on worker misclassification by imposing stiff penalties on companies found to have engaged in it. 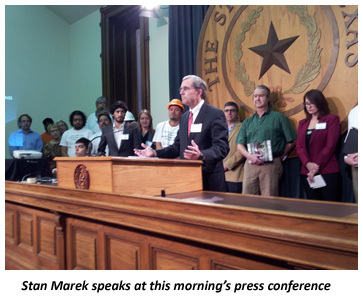 Also, a worker safety bill is being put forward by State Senator Bob Duell, R-Mesquite. “Given the economic significance of the construction industry to the state and region, it’s crucial that we act to protect the rights of workers and level the playing field for honest businesses to compete,” Duell said. “When companies cut corners and cheat on their taxes, they’re not just cheating the people of Texas, they’re cheating themselves. Many companies use the loophole of misclassification to hire and abuse undocumented workers. Those workers, whether they’re documented or not, don’t get workers’ comp. So, when they get hurt on the job, they’re dropped off at the emergency rooms at Seton in Austin, Parkland in Dallas, and Ben Taub in Houston. The end result is that taxpayers are subsidizing the labor costs of companies that rake in millions while misclassifying and mistreating their workers. Read the entire 74-page report on the study here.